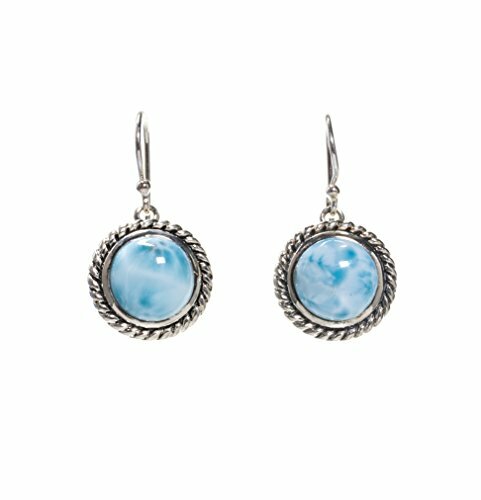 A round cushion cut Larimar sits on a bezel set of highly polished sterling silver cable design. This simple, classy, on-trend Larimar piece is a perfect everyday wear! Larimar is one of the cardinal Water element stones yet is born of Fire in its volcanic origins. A stone of clear communication, it provides the strength and courage needed to speak openly from the heart. Larimar cools tempers and calms fears, relieaves stress and nurtures the physical and emotional bodies. It is also believed to be an excellent stone for finding a soul mate. A round cushion cut Larimar sits on a bezel set of highly polished sterling silver cable design. This simple, classy, on-trend Larimar piece is a perfect everyday wear! LARIMAR: Considered one of the cardinal Water element stones, yet is born of Fire in its volcanic origins. Larimar cools tempers and calms fears, relieves stress and nurtures the physical and emotional bodies. A stone of clear communication, it provides the strength and courage needed to speak openly from the heart. FINISH: Crafted in rhodium over Italian Sterling Silver (935-945 high quality grade Sterling Silver) Chain to protect from tarnishing. Each pendant suspends from an 14-16 inch chain necklace that secures with a spring clasp. HAWAII BASED COMPANY: We operate in the beautiful Island of Hawaii. Please search BEAN & VANILLA on Amazon for more of our products and designs. If you have any questions about this product by BEAN & VANILLA, contact us by completing and submitting the form below. If you are looking for a specif part number, please include it with your message.